Mandatory (but fun!) 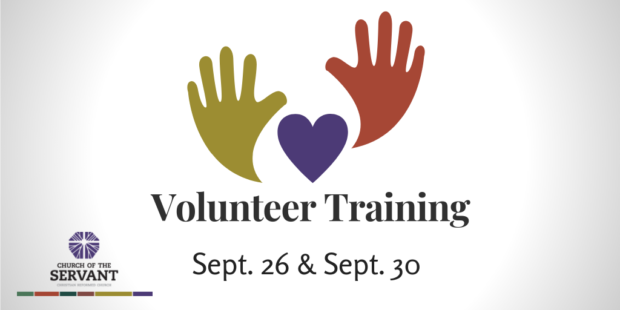 volunteer training is taking place on Wednesday, September 26 from 6-7: 30 pm and on Sunday, September 30, at 8:45 am. All COS volunteers who work with children and youth under the age of 18—or who are thinking about working with them—are required to attend ONE (1) of these annual Volunteer Training Events. Food will be provided at both of these training times and childcare will be provided in the nursery for the Sunday training event. If you plan to volunteer but cannot attend either of these events, contact Annette ASAP to schedule a training time. Also during these times, we are hosting a training event for scripture readers, intercessory prayer leaders, and liturgists. If you serve in worship in these capacities, or if you would like to, please join either Wednesday, Sept. 26 from 6-7:30 or Sunday, Sept. 30 at 8:45 am.